As you may know, Beautydirect has been recently bringing in some cult Japanese brand products into Singapore, including some very niche, can't-find-anywhere-else type products. If you visit their website, they carry a lot of brands, but here are some of my personal picks from the range they carry! My four product picks from Beautydirect's stable: Juju Aquamoist Whitening C Cream H, Juju Aquamoist Whitening C Essence H, Forme Acne Care Concealer for Strawberry Nose, and Hurry Harry Collagen Serum Bar. I wanted to sample a range of products they carried, so for this review, I picked two products from the Juju Aquamoist Whitening C range, which as the name suggests, is a range meant to help with skin whitening (always a popular concern in Asia). The two products are the Juju Aquamoist Whitening C Cream H and the Juju Aquamoist Whitening C Essence H. I also picked a Forme Acne Care Concealer for Strawberry Nose - which means that it's a concealer for noses with huge, enlarged pores and uneven surface, like a strawberry. 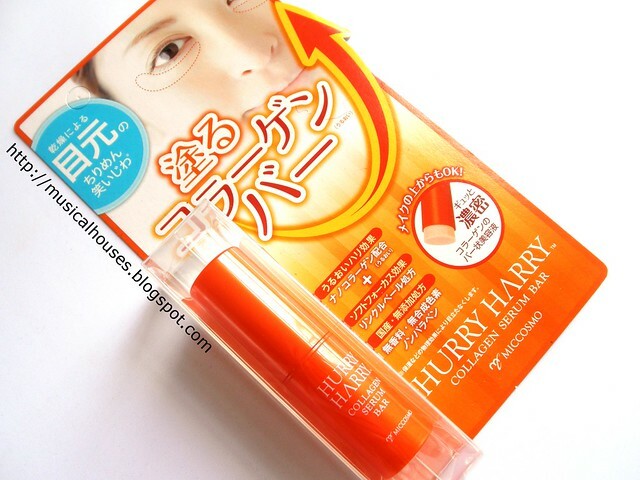 And lastly, I picked Hurry Harry Collagen Serum Bar, which is actually an eye product. I thought this was a good distribution between brands, as well as between "spot" products (e.g. for nose or eye only) and entire-face products. And as you might expect, my review process is a little more involved, because I go through the ingredients lists of the product in question, as well as evaluate the product based on my own experience with it. Since there are not one, or two, but four products here, you can imagine the post will be quite long. So if you're all ready, let's get started! First, the two products from the Juju Aquamoist Whitening C range. I've blogged about the Juju Aquamoist Moisture Lotion before, but as it turns out, the Juju Aquamoist brand has quite a few sub-ranges - there's Juju Natural (with plant extracts) and Juju Whitening C. Being a typical Asian girl, I was like, "Ooh, whitening! I want!" and got my grubby hands on it. And, as it turns out, the products do live up to the advertising, particularly the Whitening C Cream H.
Yay, whitening products! The Juju Aquamoist Whitening C Cream H and Juju Aquamoist Whitening C Essence H.
Let's start with the Whitening C Essence H. After a base of water, Glycerin (a humectant), Butylene Glycol (a solvent), and Alcohol (here probably used to thin out the mixture and enhance penetration of the product through the skin), we have Ascorbyl Glucoside, a stable form of Vitamin C, which is an anti-oxidant, as well as a whitening ingredient. So yes, right at the end of the top 5 ingredients we have a good form of Vitamin C. The rest of the formula consists primarily of other silicones and carbomers (for texure), pH adjusters (so the product isn't too acidic) and preservatives, which is pretty typical for a skin product. Juju Aquamoist Whitening C Essence H ingredients: A moisturizing base with a stable form of vitamin C.
When I used the Juju Aquamoist Whitening C Essence H, I found that it was a little thicker than a typical more-watery essence. But it still absorbed fairly well after awhile, even in this hot and humid climate without sitting on my skin. So this didn't present any issues for when I was using it. I find this works best with just a thin layer on skin - too thick and you might run the risk of the product balling up a little. This works well under makeup, too. The Juju Aquamoist C Whitening Essence H: Also works well under makeup. The Bottom Line: Use of ascorbyl glucoside helps in skin whitening, in a pretty cosmetically elegant base. 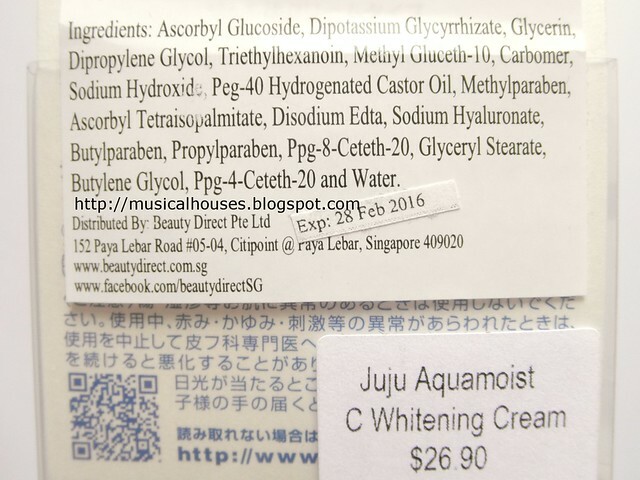 The Juju Aquamoist Whitening C Cream H also uses Ascorbyl Glucoside - in fact, what I really liked about the cream was that Ascorbyl Glucoside was the first ingredient on the list, so I definitely expect over time that there should be some effects with use. After that, we have Dipotassium Glycyrrhizate which is extracted from licorice, and is generally used for its anti-irritant properties in skincare. 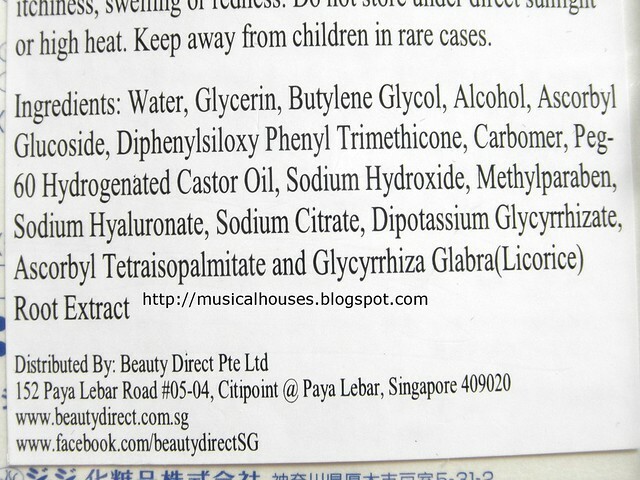 And then we have Glycerin, the humectant, Dipropylene Glycol, the solvent, and Triethylhexanoin, an emollient and skin-conditioning agent, that round off the top 5 ingredients in the list. I'm personally very impressed by the formulation of this cream - most of the top 5 ingredients, which typically make up the bulk of the skincare product offer benefit to the skin, whereas for quite a number of skincare products I've looked at, you really only get the ingredients that do the work further down the list. In fact, I think that out of the entire Whitening C range, this is probably the best formulated, in terms of effectiveness. The rest of the ingredients are typical skin-cream stuff - polymers, pH-adjusters, preservatives, other claims ingredients and so on. Juju Aquamoist Whitening C Cream H ingredients: I love that ascorbyl glucoside is the first ingredient! The cream advertises itself as a light "gel-cream", and I think that's more or less spot on. It is a cream, but rather liquid for a cream. I guess that's all I have to say application-wise - I didn't encounter any quirks with the product application. I think out of the four products I have here, this is easily my favourite. The only thing I didn't like? Well I'm not a fan of jar packaging (pumps or tubes are my preferred choices), but in this case, it's forgivable - although some forms of Vitamin C are notoriously unstable to light, heat, or air, like Ascorbic Acid, Ascorbyl Glucoside is pretty stable (although less effective than Ascorbic Acid), and has great stability in the presence of light and air, so I'm not too worried about the jar packaging affecting the product. If you are, though, then just ensure that you don't leave your product sitting around for too long, and limit its exposure to heat and light (i.e. don't let it sit open in the hot sun at your table). A light texture also makes the Juju Aquamoist C Whitening Cream H easy to use. The Bottom ine: A fairly high percentage of ascorbyl glucoside, combined with anti-irritants and humectants, not only helps in skin whitening, but also works well as an all-around face cream, in a light-textured base. 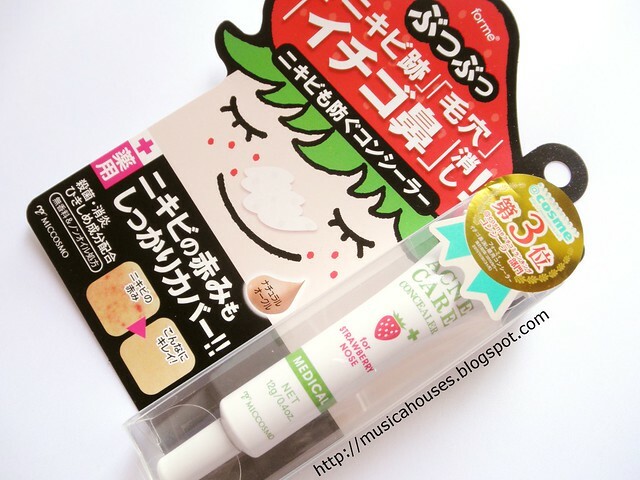 Next, the Forme Acne Care Concealer for Strawberry Nose. I've actually never head of the brand Forme before until Beautydirect carried it, but it is one of the sub-brands under Miccosmo, a Japan-based company who has been making beauty products since the 1980s. Anyway, the Forme Acne Care Concealer is supposed to be a concealer specially for those with huge pores on their nose, or for areas with large pores in general. 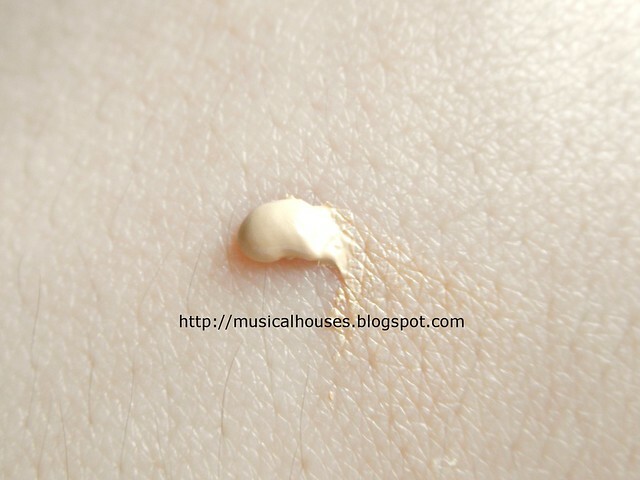 The product itself is a yellow-beige cream that is quite thick in texture. It feels a tad putty-like, which I suppose is what it is meant to be, putty for your pores. The Forme Acne Care Concealer for Strawberry Nose: Tinted with a yellow-beige colour, and a thick texture. Oh well, I thought, I do happen to be the very proud owner of a very "strawberry"-like nose. So what better way than to attempt to try said product on me? Check out the before-and-after. These are my unedited photos - you can see how gross-looking my nose in the "before" photo is. (Darn macro photos that zoom in like 30x onto your nose.) That small dollop of concealer is what I used for my entire nose. I simply spread out a thin but even layer and covered up whatever pores were visible. 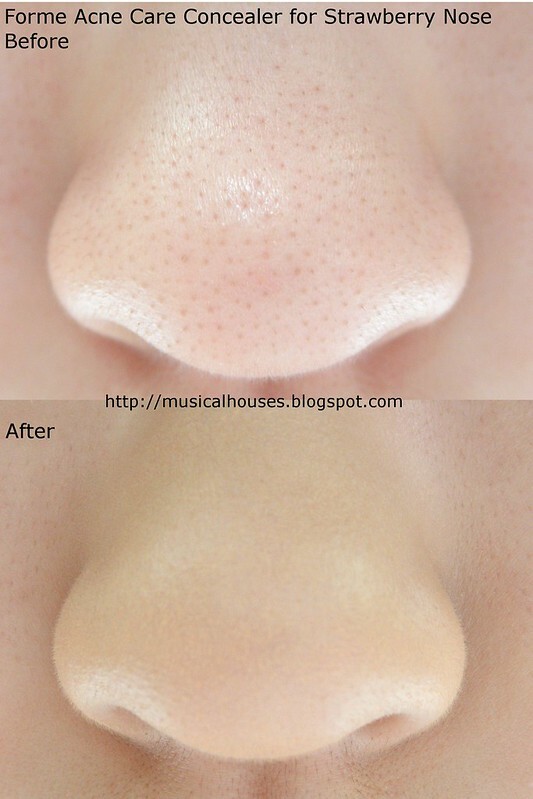 Forme Acne Care Concealer for Strawberry Nose before and after: Wow this product actually works! Look at my faked-up pore-less nose! As you can see, it works pretty well! The only gripe I have is that the colour is a bit too dark and orangey for me (slightly lighter than NC20). But I suppose I could blend it out at the edges and layer with a powder on top, and it would be just fine. I suppose as long as the colour is only slightly different from your actual skintone, this is something that you could make work. As a test, I wore this out for a day, and it seemed to hold well. It also works nicely under powder or other makeup. The Bottom Line: The Forme Acne Care Concealer does indeed cover up my huge pores well, and serves nicely as a base under makeup, too. Lastly, the Hurry Harry Collagen Serum Bar. Now I know that collagen in skincare doesn't actually penetrate through to the skin (and even if it did, it wouldn't be incorporated in your skin's matrix), but when I reviewed this, I had thought it was a concealer (although the product clearly states "This is not a concealer" - D'oh! ), so I selected it for review, only to find that I was stuck with a "collagen serum bar". I guess they mean collagen serum, but in solid form. Hurry Harry Collagen Serum Bar: Just so you know, this is NOT a concealer! To be honest, I had pretty low expectations for it. Collagen Serum Bar, I thought. What a load of hogwash. But it had raves from other bloggers, so I thought I'd give it a go. Turns out, it felt quite moisturizing on my eye area, and felt quite nice going on - it glides on with a very nice texture. Also, I found that it actually works really well as a primer for undereye concealer. I usually have problems with my undereye concealer/powder getting really crinkly and settling into fine lines and wearing off, but I found that with the Hurry Harry Collagen Serum Bar underneath, application was a lot smoother. I think this works surprisingly well as an undereye primer of sorts! Below, you can see a demonstration with the Hurry Harry Collagen Serum Bar applied, and then some MAC Studio Finish Concealer in NC20 was layered over it. I like the natural finish it gives, too. Hurry Harry Collagen Serum Bar: It does work well as an undereye conditioner, and also as a undereye base. From an ingredients standpoint, I could definitely see why this works as an undereye primer. This is because the ingredients consist of various silicones (Dimethicone, Dimethicone/Methicone Silsesquioxane Crosspolymer) and film formers (Methyl Methacrylate, Polyethylene) for a smooth finish on the skin, as well as some emollients (Isotridecyl Isononanoate, Diisostearyl Malate, which is most commonly found in lipsticks, and Phytosteryl/Octyldodecyl Lauroyl Glutamate) which help to condition the skin, as well as emulsifiers (Ceresin, Sorbitan Sesquioleate). The advertised ingredients, like the collagen and sodium hyaluronate, don't really appear until the end of the ingredients list, but then again, if you've read my post on collagen in skincare, you'll know that I don't really expect the collagen to be doing the heavy lifting. Instead, what you get is a solid product that is very emollient on your undereye area, and has a nice finish and skinfeel. This is a good thing - and for the most part, you'll be getting a product that helps to condition your undereye area, thus preventing wrinkles (because one of the contributing factors to wrinkles is simple old skin dryness), and also works well under makeup. Which was my experience with the product exactly. Hurry Harry Collagen Serum Bar ingredients: Emollients to condition skin, silicones and film formers to give the product a nice finish. So would I recommend this? Well it's advertised as a Collagen Serum Bar, and I don't know if I would really recommend it in that capacity. But, I do happen to think this serves very well as an 1) undereye base for makeup, and 2) an easy-to-apply product with emollients to condition the skin around your eye area. But I wouldn't expect any miracles from this product (can you expect miracles from any product, ever? 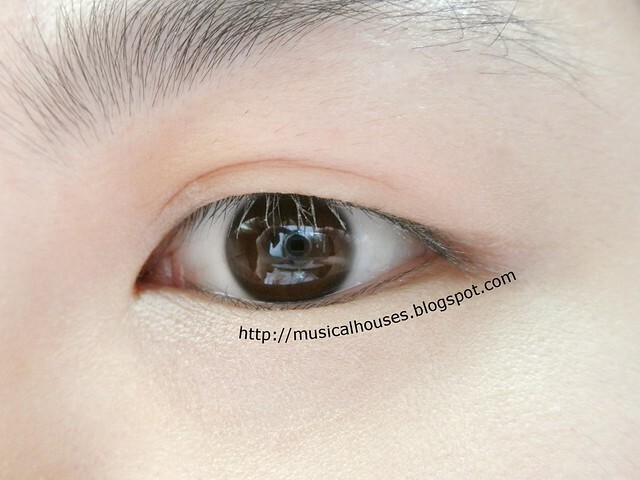 ), but over time, I do think it would help to improve the overall appearance of the eye area. Just don't expect any deep-seated wrinkles to be gone overnight! The Bottom Line: A double duty product that has emollients to condition the undereye area, and also serves very well as an undereye base. I heard Juju is a lot like Hada Labo (maybe they're owned by the same company? not sure) so I really want to try some of their stuff too! @Arian Yupangco: They do have some similarities, but they're not 100% the same. And they're not actually owned by the same company, so they are actually competitors on the market. I think because they have similar product packaging and product line-up (eg both have a whitening range), they do look similar at first glance, but there are some differences in formulation. 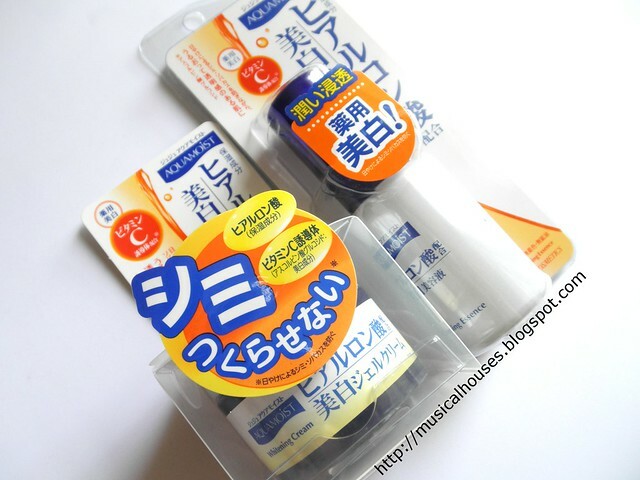 The Juju Aquamoist Whitening C line uses primarily Vitamin C (ascorbyl glucoside) as its whitening agent, while the Hada Labo line (which I've reviewed here before: http://musicalhouses.blogspot.com/2013/05/hada-labo-arbutin-whitening-lotion.html ) uses arbutin instead. Both will work as far as whitening is concerned, although Juju seems to have a somewhat higher % of the whitening ingredient from what I can tell. Also, the Juju product has alcohol in it to enhance penetration of the product, but the Hada Labo product doesn't have alcohol. So I feel like the Juju product would appeal more to oilier skins in more humid climates, while people with dry skins might prefer the Hada Labo product. Anyway, that's my breakdown in a nutshell, and I hope it helps! hello! I always appreciated your honesty in your reviews! may I know if it's necessary to use an eye cream before applying the hurry Harry collagen serum bar? @mystatuesque: I think that would depend on how dry your skin around the eye is. The product instructions say you can use it over other eye creams, but in my opinion, this isn't necessary if you don't have dry skin on your under eye or any major issues with your eyes. But if you do find that the Collagen Serum Bar isn't sufficiently moisturizing, then by all means feel free to use an eye cream under it. Hope this helps! Where can i buy in singapore? 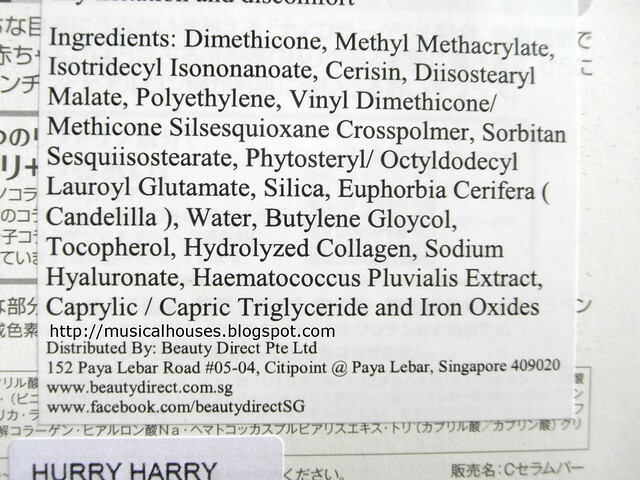 @Anonymous: You can buy it online from BeautyDirect, their website is: http://www.beautydirect.com.sg/ and I think they also have a shop at 100AM where you can go and buy the products in person too! Thank you for the review on the Hurry Harry Collagen Serum Bar! The detailed description of the ingredients was really insightful and helpful!